This is a promotional game for Elah candies. Elah offered cycling trading cards with their Ciclo Ball Bum candies (or maybe it was chewing gum?). 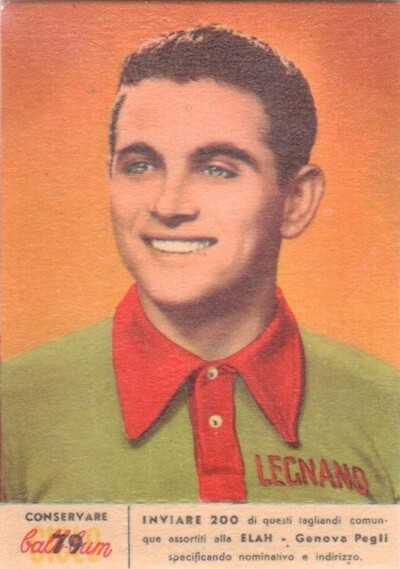 On the botton of the cards there was a small cut off stripe (scroll down to see one of the cards). You had to send 200 stripes to get the game and the album to collect the cards. 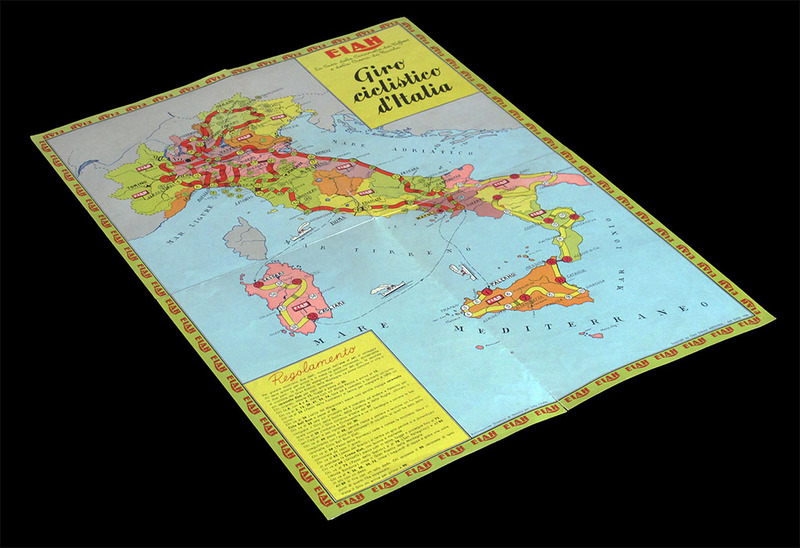 Elah was founded in 1909 in Genova and still exists under the brand Elah-Dufour. The board is made of light cardboard and measures 58 x 42 cms. 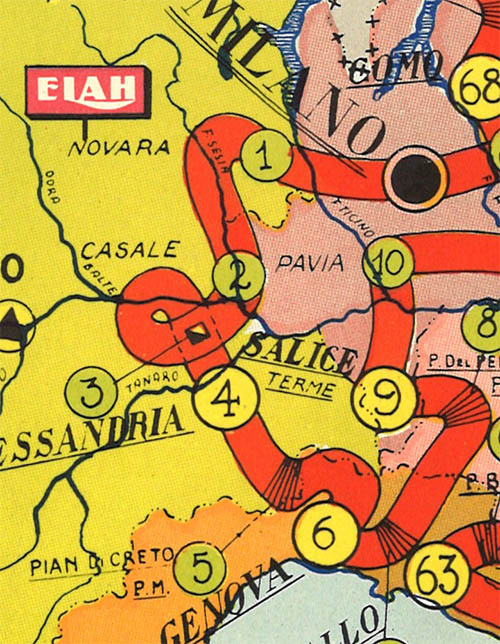 The main route (red route on the game board) follows the stages of the 1956 Giro d'Italia, but riders that fall on some spaces are force to take a longer (yellow) route, so that the game covers all Italy. Falling on square 39 (Rome) forces you to take the Citavecchia boat to Sassari, ride to Cagliari, and take another boat back to Salerno (square 30). Even worse, whoever falls on square 32 (Napoli) goes directly to Palermo where he engages a long (26 squares!) 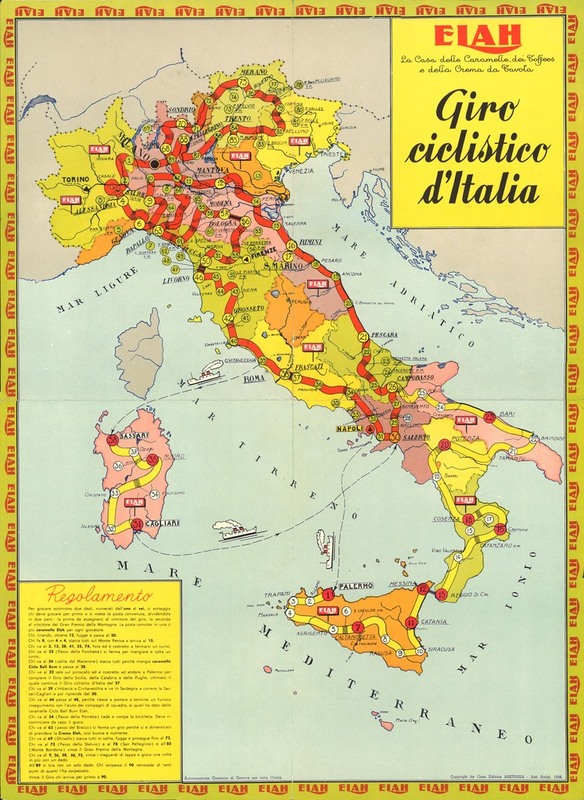 tour of Sicily, Calabria and Apulia before getting back to the main route in Campobasso (square 26). The game, of course, is a simple roll-and-move game, played with two dice. 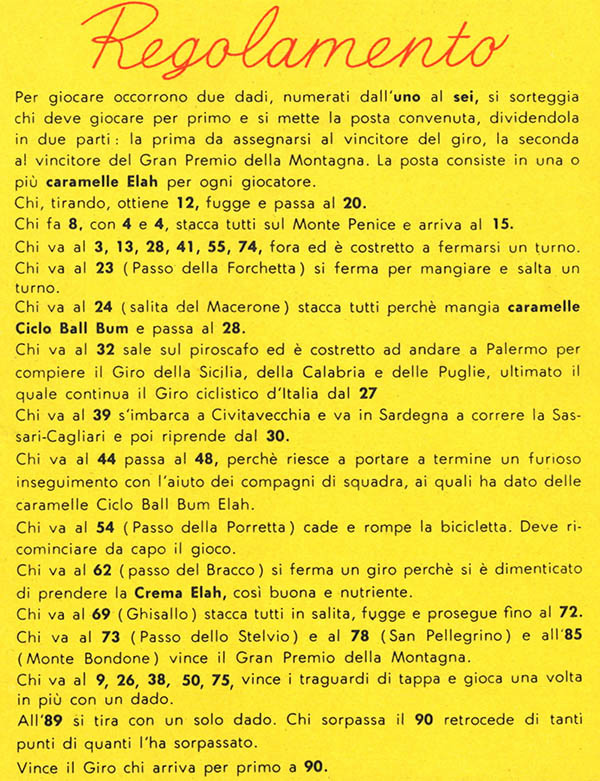 Players have to put one or more Elah candies in the common pot and the price is divided evenly between the winner of the Giro and the winner of the mountain classification. While the former is clearly determined by the rules (first rider to reach square 90 by an exact throw), the king-of-the-mountain rules are not so clear. 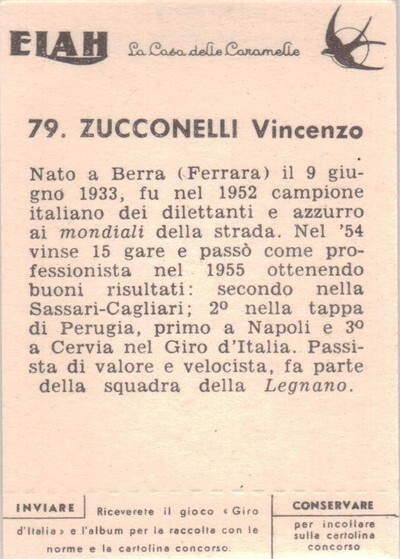 The rule say that "whoever falls on square 73 (Stelvio) and 78 (San Pellegrino) and 85 (Monte Bondone) wins the Gran Premio della Montagna". What if no one falls on these squares, or not on all of them? This is not the only confusing rule. The first rule, for instance, says "Whoever throws 12 breaks away and goes to square 20". I guess this applies to the first turn only (or else my idea of breakaway is different from the game designer's). 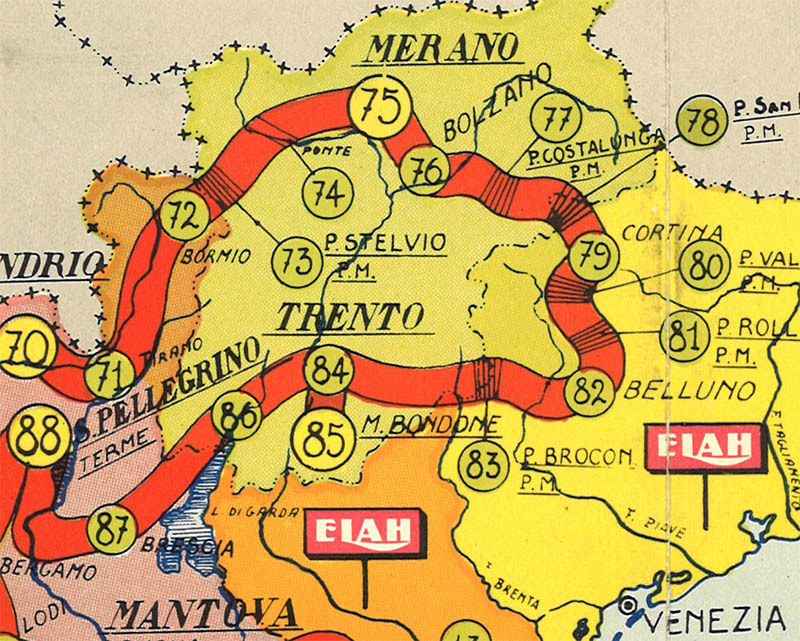 By the way, how do you get to the Monte Bondone (square 85)? The mark on square 3 might be a puncture (miss one turn), though the other punctures mentioned in the rules are not marked.